There is no such thing as a network without issues. But how much impact do those issues actually have on subscriber loyalty? First of all we need to define what an issue is. Is it something the network monitoring classifies as a network failure in the system? Is it critical when the small light next to the technical KPI dashboard changes from green to red? Perhaps, but this is usually not how the end-user sees the network. There are many different dimensions that shape their perceptions such as device compatibility with the contract, or the user’s ability to master all the device’s features etc. For the user, the device is his window onto the network. But how many of these issues cause the subscriber to become angry on a weekly basis? 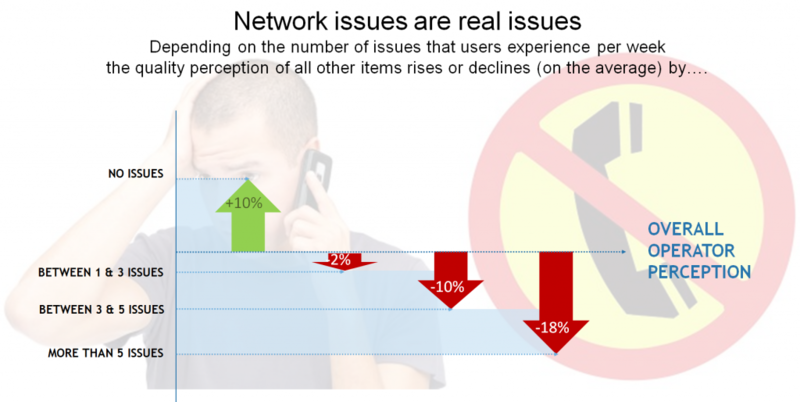 Well, we see that only those users who never experience any issues tend to have a positive perception of their mobile operator. That comes out as 45% of these respondents but the other 55% are not that lucky. The value of the operator drops by 6% for those who experience 1- 3 issues per week and it declines to almost 30% for those who experience more than 5 issues a week on average. The latter group are probably already looking for a new operator at that stage anyway. Most critical for users is the availability of the network. If it is not available everywhere then that causes a huge problem. Almost 40% rated this aspect very poorly with their operator. They pay on average more than users who experience less issues and that is also why they expect more from their network. But there is also light at the end of the tunnel because users who never experience any problems spend more money on their operator and are still very loyal. But is it possible eliminate all the issues the subscriber perceives? Probably not, but by trying to understand their key pain points from the subjective side and not from the technical emotionless KPIs might reduce the number of issues on the customer’s end. Users feel that perhaps their contract just does not fit their needs or their device are too complicated for them to experience all the benefits of the network. Then let’s turn the negative experiences with negative consequences into a positive story with positive consequences where the user feels the operator understands the issues the way they define them and not how the system defines them. This could create a “win-win” situation for both sides where the user remains loyal and is willing to spend more money on the partner that listens to their problems.